After a routine security check by George Smiley, civil servant Samuel Fennan apparently kills himself — even though Smiley's report cleared Fennan of all the allegations. When Smiley finds the head of British Intelligence is trying to blame him for the man's death, he begins his own investigation, meeting with Fennan's widow to find out what could have led him to such desperation. But on the very day that Smiley is ordered off the enquiry he receives an urgent letter from the dead man. Do the East Germans — and their agents — know more about this man's death than MI6 previously imagined? Le Carré's debut novel introduced the tenacious and retiring George Smiley in a gripping tale of espionage and deceit. This was another of those books I wanted to knock off my TBR list this year. It's been there for quite a while and I've passed it by several times — mainly because I'm not really a huge fan of spy novels, although I did enjoy several of Len Deighton's books back in the '70s. 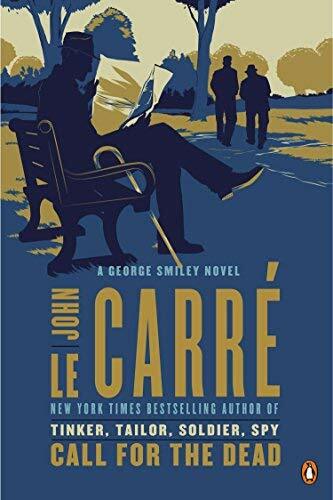 But John Le Carré's Call for the Dead is more whodunnit than espionage, with George Smiley investigating what actually happened in the death of civil servant Samuel Fennan. So even though I was a little dubious going in, I ultimately enjoyed this quite a lot. Le Carré is rightly famous for his character development, and even the minor characters here are well-drawn, believable and interesting. Of course, George Smiley is his greatest creation — sort of the antithesis of James Bond and all those charismatic action heroes. Smiley is not dashing or handsome (his ex-wife called him "Toad"). But he does what he does very well, with intelligence and efficiency and a great deal of sympathy for his fellow human beings — whether or not they work in the spy trade. This book provides a fine introduction. Qualifies for the following reading challenges: Cloak and Dagger Challenge, Monthly Key Word Challenge.